Outhouse – As if outhouses aren’t scary enough already, a dad tells his little girl about monsters…right before she needs to go take care of business. Old Souls – A group of servants has a séance, inviting ghosts to dine with them on Halloween. The Fire Watcher – A father reveals to his son that their family is cursed and must therefore keep a bonfire burning all night on Halloween to keep “Old Cleft Foot” away. Lord of the Dragon – To keep his crops thriving, a man is forced to feed flesh to his scarecrow. The Spell Collector – Three boys sneak out to the creepy house of a woman rumored to be a witch on Halloween night. Old Wife’s Tale – On Halloween, the grim reaper comes knocking on a couple’s door. They just don’t know which one of them it’s there for. Following the Leader – A teacher brings her young students to a Halloween parade, but they end up taking an unexpected detour. Haunted House – A couple becomes unwitting participants in a haunted attraction. 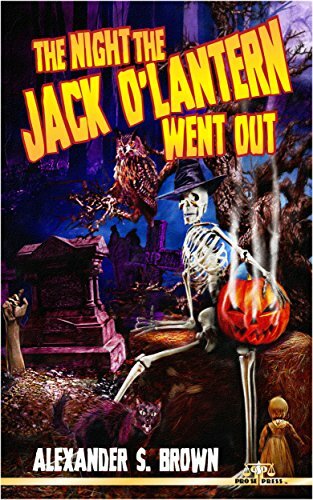 The Night the Jack ‘O Lantern Went Out – A young prankster’s worst fears about pumpkins come true. Luck – A disliked teacher makes the mistake of crossing a black cat just before Halloween. Mean Spirited – A group of boys insists a girl is afraid to go up to a serial killer’s grave on Halloween. She proves them dead wrong. Owls – Two children are terrified when their sick grandfather tells them that owls eat old sick people on Halloween night. The Night the Jack O’ Lantern Went Out by Alexander S. Brown is available in both ebook and paperback on Amazon. This entry was posted in Everyday I Read the Book: Literary Thoughts, The Evil of the Thriller - Everything Horror. Bookmark the permalink.